For other uses, see Crows Nest (disambiguation). Crow's nest on a tugboat. This position ensured the best view for lookouts to spot approaching hazards, other ships, or land. It was the best device for this purpose until the invention of radar. In the early 19th century, it was simply a barrel or a basket lashed to the tallest mast. Later, it became a specially designed platform with protective railing. The barrel crow's nest was invented in 1807 by the Arctic explorer William Scoresby, Sr. A statue in Whitby, North Yorkshire commemorates the event. It should not be confused with the top, the platform in the upper part of each lower mast of a square-rigged sailing ship. The first recorded appearance of the term was in 1807, used to describe William Scoresby's barrel crows nest platform. According to a popular naval legend, the term derives from the practice of Viking sailors, who carried crows or ravens in a cage secured to the top of the mast. In cases of poor visibility, a crow was released, and the navigator plotted a course corresponding to the bird's flight path because the crow invariably headed towards the nearest land. However, other naval scholars have found no evidence of the masthead crow cage and suggest the name was coined because Scoresby's lookout platform resembled a crow's nest in a tree. Sometimes, the term is used metaphorically in reference to topmost structures in buildings, towers, etc. Since the crow's nest is a point far away from the ship's centre of mass, rotational movement of the ship is amplified and could lead to severe seasickness, even in accustomed sailors. Therefore, being sent to the crow's nest was also considered a punishment. 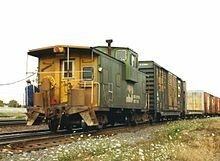 In classic railroad trains, the box-like structure above the caboose, the cupola, was also called the crow's nest. It served for observation of the whole train when in motion. In hunting, a crow's nest is a blind-like structure where a hunter or a pair of hunters commit themselves to stalking game. A crow's nest is not a normal type of purchasable blind, but an improvised position, built by using locally discovered natural flora (tree branches, moss, snow (during winter) or sand (during summer), etc.). A crow's nest works in most environments and provides a good lookout point (hence the name) when built in an elevated position like a hillside or top of a hill. This page was last edited on 22 April 2019, at 21:58 (UTC).